Doctors, nurses and other health care providers owe the same duty to meet the reasonable standard of care in the medical community. When it is proven that a health care provider violated the reasonable standard of care to a patient, they should be responsible for the damages. While a simple mistake or even a bad outcome may not be enough to constitute negligence, a death or injury caused by the failure to meet minimum standards of care or the failure to diagnose an easily detectable illness may be malpractice. Unfortunately, the Texas legislature and Texas Supreme Court has placed caps or restraints on parties with legitimate claims from receiving a recovery that will protect them from the harm that was done. Most trial lawyers won’t handle Medical Malpractice claims because of the expense in bringing an action and the limitations on recovery. A few lawyers still review these claims as a matter of principal and refuse to dismiss the rights of an injured person. At Jimmy C. Bailey & Associates, P.C. we represent those injured from medical negligence and aggressively investigate and pursue claims for catastrophic injuries and death from personal injury, medical malpractice and wrongful death. 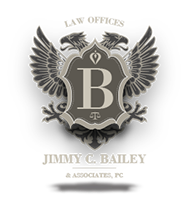 If you have been injured or have lost a loved one because of the neglect of a doctor, hospital or other health care provider, call Jimmy C. Bailey & Associates, P.C. and we will advise you of your rights and review your potential medical malpractice claim. We treat each client and their case with skilled, compassionate understanding providing a background of aggressive success to achieve the fullest recovery for each client depending on each individual’s injury and allowed damages. We have successfully resolved numerous matters in the past for serious personal injury, wrongful death and medical malpractice.